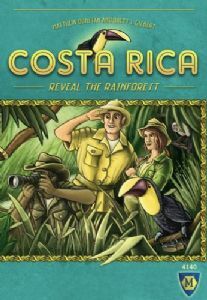 COSTA RICA: Reveal the Rainforest A Family Game for 2-5 Players Aged 8+ Published by MAYFAIR GAMES / LOOKOUT SPIELE Designed by Matthew Dunstan & Brett J Gilbert Illustrations by atelier198 In this game there are six specific animals being tracked in this part of the Rainforest, 2 animals for each terrain type. In the Mountains can be found the common Chestnut-Mandibled Toucan and the rare Jaguar. In the Coast/Wetlands the Basilisk lizard is common and the Red-eyed Stream Frog is rare and in the Forest the hunt is on to track the Capuchin Monkey (unfortunately for me it’s not the Cappuccino monkey and so it is common) with the huge Rhinoceros Beetle (being rarer than John, Paul, George or Ringo in their heyday). The animals can only be found on tiles of their specified habitat sometimes only one being spotted, sometimes a pair of the same animal and occasionally two different animals. COSTA RICA is a fast paced fun game with an easy to understand set of rules and a great selection of colourful, sturdy components that add to the fun. The game is played on a hex shaped board made out of single hex-shaped tiles. Creating this board is quite awkward for younger players, and although it helps them to understand how to put the shape together a card frame would be a great help towards getting the game started a lot quicker. Seeing as Mayfair have already previously supplied similar frameworks in other games, namely Catan, I am surprised, even though this is a Lookout Spiele production, that they never included one here. There are three types of hexagonal tiles; Mountains, Forests and Coast/Wetlands, each easily recognised by their distinctive backs, the colours of which are reflected on the animal front sides. The players are hunters out to count and shoot certain of the Rare and Common animals of the Costa Rica Rainforest. Oh, and when I say “shoot” I mean with a camera not a gun. Some of the tiles have a red Mosquito warning triangle (aka a Threat) on them which means that the group should proceed with caution. One Warning is okay but if a second tile is flipped with a Threat on it then the expedition stops, the leader is returned to base taking with them any tiles that have been flipped except those with the Threat symbol, these tiles are discarded from the game. If players collect any tiles with a Warning on them the Threat is nullified once the tile is face up on the table as part of a collection. Players have six explorers each of which they place one at the six points of the hex board making 6 groups of individual hunters. One player is determined as Start Player and they choose one of the groups and flip over the tile they are next to. At the beginning of the game there is only one tile per group that can be flipped but as soon as a group is moved forward, either onto the tile or into the space it left when it was removed, the group have choices.On their turn the players decide which group of explorers to move, the only criteria being they must have their explorer in the group. The first player flips over a tile and regards the animal or animals thereon. If they wish to collect it/them (in our minds, as the game is about counting the animals and not capturing them, we decided that by taking the tile/s you are actually taking pictures of the animals and the tiles represent those photos) the player simply takes the tile and their explorer and places them both in the area in front of themselves. The explorer has done his job and can now rest for the remainder of the game. If the first player doesn’t want the tile they offer it round in turn order to the other players. If another player takes the tile they also return their explorer with it and the turn passes to the next player. If all players pass on the tile then the leader moves the group on by flipping an adjacent tile (adjacent to the tile just explored) and the process continues. Players will soon work out that they can manoeuvre their group to cut off other groups, often leaving another group stranded with one or no tiles to explore. Here, in this example, you can see that Blue is the last member of an expedition and it is now her turn. Blue can flip either the Coast/Wetlands tile or the Mountain tile. The best move would be to flip the Coast/Wetlands tile and then, whatever it is and whether it has a Threat or not, flip the Mountain tile in front of the Group led by Red. This would give Blue the opportunity to carry on removing tiles until they either decide to stop and gather all they have uncovered or they are forced by Threat to stop, in which case all flipped tiles are still removed. However, because I am playing Blue and I am excited about being able to cut the other players off, I forget to think and simply flip the Mountain tile in front of Red and add it to my collection. In my defence the flipped tile did have a Threat and it was one I needed to complete my set, but this is the type of decidion you have to make. Stranded groups are sent home without any tiles. It is possible to be the only member left in a group and this can be a very good thing, if you think before you act, as all the tiles you collect will be yours, the Threat rule withstanding of course. When the last explorer has returned home the game ends and the scoring takes place. Each animal has a similar value whether it is Rare or well done ... err I mean Common (apologies to vegetarians for the slip into meat-eating culinary humour there). One animal is worth 1 point but two animals are worth 3 points and so on according to the points chart. There is a bonus of 20pts for collecting one of each of the 6 animals and this bonus is given for every set you collect, though obviously you can only use an animal once in a set. Animals are however counted separately as well though so for example if you only had 6 tiles and they were all different animals you would have 26 points, one point per animal plus 20pts for the collective set. We have yet to play a game where anybody has failed to collect at least one set and indeed the majority of our games have been so close as to only be separated by the fact that someone had managed to get 3 or 4 of two different types of animal when others have only collected 2 or 3, the points difference from the score chart being the tie breaker rather than the bonus points for the sets determining the winner. COSTA RICA has elements of several games, collecting sets, deciding whether to stick or twist, randomly placed tiles forming the board etc, and they all come together to form a really nice family game. The only player interaction as such is noting what animals the other players have collected or are after – these always being displayed face up on the table – and using this information to decide whether to take the tile/s on offer or to move the expedition on. It plays nicely as a 2-player game using exactly the same rules and you can lengthen the 2 player game by having 2 colours each; if you have a spare set of meeples or counters available to you three players can also play 2 colours each, just remember if you are using more than one colour per player to alternate turns between players and colours. This is purely a family game. There is nothing deep or hidden in it and no special strategies or tactics that can win or lose you the game. The tiles are laid out randomly each time you play, the explorers begin at the same six points, though obviously these will not always be the same six terrain types, the animals do not move, there are no nasty hazard cards, nothing to remove tiles from your collection, you cannot move a group you do not have an explorer in and there is nothing you can do to prevent being cut off by the movement of another group, so no forward planning. The best you can do is at first gather as many tiles as you can and then try to collect animals that will get you the bonus 20pts. Having 7 of the same animal gets you 28 pts but it is extremely unlikely to happen in a 3 or 4 player game as all players will need at least one of that animal for their own sets. COSTA RICA plays in 15-30 minutes with 3 or 4 players once you are adept at setting up the board and know the rules. It is therefore a great game for enjoying with younger players and players new to the European board gaming style. It is not a great game for players who are looking for strategies or a deeply meaningful thought invoking challenge, it is a fine bit of fluff designed to be played quickly and cheerfully and to that aim it has truly succeeded. Family game of push your luck and tile flipping. Explore the jungle, mountains and rivers to gain common or rare animals but mind the danger. The more animal sets you gain the more victory points you gain at the game end.